Leah is a music and theatre educator. In her last semester at Penn State she student taught in the Central Dauphin and Palmyra Area School Districts. 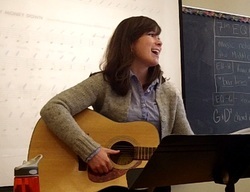 In those settings, Leah taught kindergarten through 8th general music, 4th through 8th grade chorus, individual choir lessons, and a music class entirely dedicated to special needs students. While studying at the Royal Central School of Speech and Drama, Leah completed courses in Applied Theatre, specifically focusing on facilitating writing projects with diverse communities of students. 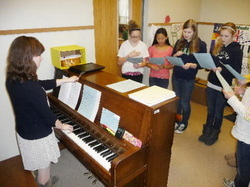 Currently, Leah is the Music Teacher for the Delta Middle Program, part of the State College Area School District. At the Royal Central School of Speech and Drama, Leah's studies focused on the benefits of theatre participation for students and communities. Below are links to her Philosophy for Middle School Theatre Education, as well as a plan for an Intergenerational Theatre Project that Leah designed while pursuing her master's degree. Also included below are links to materials that Leah prepared for her 6th grade general music class as well as video from a rehearsal with the Palmyra Area Middle School 6th grade choir.